Now onto XM569. This one's a B.2 and is all that remains of the full aircraft that was displayed at the Wales Air Museum at Cardiff airport. The collection there expanded very quickly yet had no buildings to house the aircraft in at all, and being near the sea the salt air quickly made corrosion a big problem in their aircraft. The museum's owners didn't really treat the aircraft as historic exhibits - and applied some unusual paint schemes (e.g. RAF and then RAF Gulf War paint schemes on a Mk.1 Buccaneer!). Eventually the museum collapsed and the collection was dispersed; several of the aircraft were rescued, but a good number were scrapped. 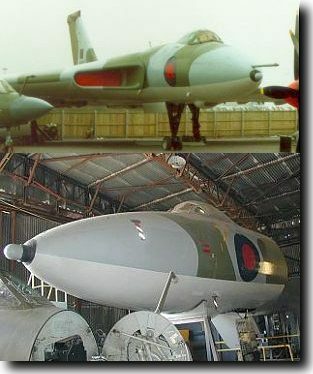 XM569 was one of the unlucky ones but the nose section was saved. It was used to advertise a new leisure centre (The Planets) in Woking - made up as a rocket with silver paint and attached fins. It sounds bad, doesn't it! But thankfully when that task was complete, XM569's luck changed for the better. The fins were removed and the owners loaned it to the Jet Age Museum at Staverton - where it is now displayed on a raised framework with the access ladder down so that visitors can take a look inside. Inside the nose is in good condition with only a few missing instruments. The museum's volunteers hope to light up the cockpit in the same manner as their Canberra's cockpit (which looks superb - roll on similar treatment for XM569), and have stripped off most of the silver paint to reveal the camouflage colours once more. Unfortunately the museum has been forced to shut its doors by the airport authorities who want to demolish the hangar that the museum use, so for the time being this aircraft is not accessible.